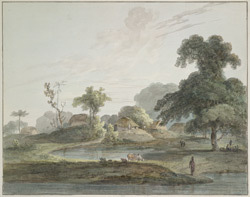 Thomas Daniell and his nephew William arrived in Calcutta in 1786 and spent the following nine years travelling through virtually unknown parts of India observing and recording with skill and accuracy the diverse scenery and architecture they encountered. William kept a journal which, along with the notes inscribed on their pencil drawings, colour washes, watercolours and oil paintings, provided a thorough record of this strange and beautiful country for an eager western audience. When they returned to Britain the Daniells engraved the album of views entitled ‘Oriental Scenery’ for which they are best known.